1st. 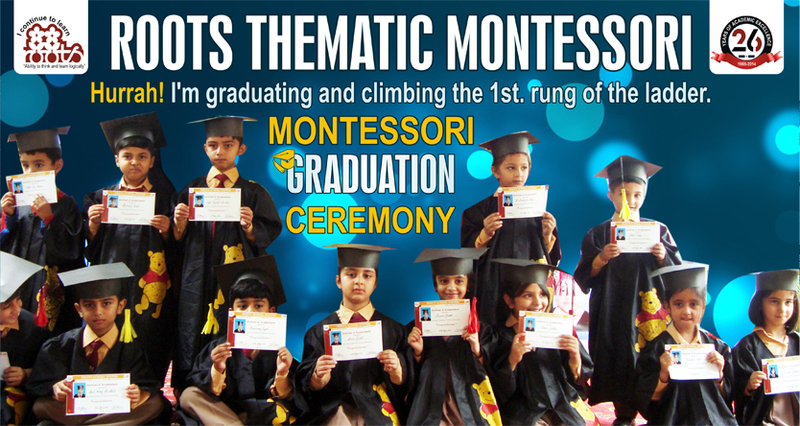 Roots Montessori International School established in the twin cities of Rawalpindi / Islamabad on 10th April 1988 at 74 Harley Street, Rawalpindi Cantt. 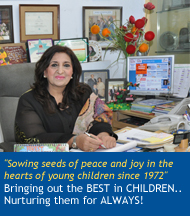 by a compassionate and visionary educationalist - A Montessorian ....Riffat Mushtaq. She advocated Montessori Method of Education in the early years in the North of Pakistan. Each child is born with enormous potential, which, given sensitive support, will unfold, revealing the uniqueness of each human being. Dr Maria Montessori saw that children learn best by doing, and that happy self-motivated learners form positive images of themselves as confident, successful people. She created specially designed resources to foster independence and a love for learning from an early age. The Montessori approach is holistic and aims to develop the whole child. Children are the challenge and inspiration of today and are the hope, protectors and champions of the future. Only parents and teachers can pass on a legacy that destines what the world tomorrow will be. "roots" is the home of "love and joy" where each child is assisted in growing according to his natural design. We believe while no child is exactly like another, for each the level of achievement can be raised, aspirations stirred, potential talents discovered and developed so that he can find his own worth and dignity and feel the thrill of success. Our main goal in education is to provide an environment where each child aspires for excellence in all fields of life. To succeed in achieving the desired goal, we would need not only the devotion and dedication of the teachers, but also the total commitment of the taught, as well as the fullest cooperation of the parents. Our environment allows each child to experience the excitement and joy of learning. We strive to help them to perfect their natural tools for learning so that their potential is uncovered to the maximum. We enjoy working closely with pre-school aged children. In a specially prepared environment, the children participate in activities that allow them to grow and develop at their own pace. We help the children to develop themselves in a prepared montessori environment which has a variety of choices for the young to choose from and work independently. Thus he learns every thing without knowing that he is learning. Qualified montessori directresses direct the children's energies into constructive channels by guiding them with love, encouragement and affirmation so that they may develop the fullness of their own individual human potential through independence, inner discipline and discovery. We hope that the time your child spends here will be both enjoyable and profitable. We look forward to a happy and successful association over the coming years, as we welcome parental involvement and encourage participation in the life of the school. Roots Montessori & High School is a model institution styled on the modern educational system of international standard specially designed to meet the requirements of the child in his early, formative years by involving the three e's EXPOSURE EXPANSION AND EXPLORATION Each child is to be assisted in growing according to his natural design without deprivation or forcing in an environment and by a process, which also supply a social direction to his achievement. All activities are tuned in to the child's stage of development. The institution was established in April 1988 at 74 Harley Street, Rawalpindi Cantt by Mrs. Riffat Mushtaq a renowned and visionary educationalist fired with enthusiasm and missionary spirit in the field of education. She took the challenge of introducing modern methodology, child centered teaching, creativity, puppetry and activity based learning in "roots- the 21st Century Creative School" which she named as the "home of love, joy and creativity"
Being a Montessorian and a compassionate teacher of the young for more than two decades she introduced the International Montessori Method of Education in the early formative years. Thus she founded the 1st Montessori school in the twin cities of Rawalpindi and Islamabad in 1988 and brought awareness about this method of teaching. The growth of children in this institution is the success of the teaching methodology at roots where each child is assisted in growing by a system so that he feels the thrill of success and finds his own worth and dignity. Mrs. Riffat Mushtaq's roots can be traced back to her illustrious Grand father, Late Khan Mohammad Khan Sahib(MLA) who is commonly known as the "Sir Sayyed of Kashmir". The success of Roots Montessori System of Education is evident from the high quality of pupils the institution is producing every year. Roots Graduates have created world record in academia and its brilliant alumni is spread all over the world pursuing their chosen careers in leading international and national organizations. Roots is unique as it believes in the holistic development of the child and offers continuous education facility from Montessori to O/A Level/ Under Graduate Level. Today, roots has grown into a leading educational institutation par excellence imparting all round education and its quality of teaching has been recognized at national as well as international forums. * Every child is a unique person with creative potential, the drive to learn and the right to be treated with respect as an individual. * As children are profoundly affected by society and their immediate surroundings, we create an environment in harmony with the child's natural development. * Children must be given freedom to work and move around, within guidelines that enable them to see themselves as both independent and part of a group. * Montessori materials help children to explore and master their environment through activities which aid the development of the whole personality. * Children are encouraged to work at their own pace, either individually or in co-operation with others. group, to assist their full development. The child moves freely around a Montessori classroom talking to other children, working with any equipment he chooses or asking the teacher to introduce a new material. capacity to focus their attention for an activity. Successful completion of such tasks give children a real sense of their own achievement, and this builds their self-confidence. Through freedom and movement and Montessori exercises for the care of the environment, care of self and development of social skills, the child is helped towards social awareness. Children are aware of a world, constantly exploring it and taking in impressions through all their senses. The sensorial materials encourage children to order and classify the physical properties of the world they live in. These activities stimulate and develop the senses, refining children's powers of observation, perception, exploration and communication. Experience of the natural environment helps the child achieve harmony with it. It also contributes to the child's spiritual growth. The child should grow up close to nature. Montessori Mathematics materials enable even a very young child to achieve a natural appreciation of mathematical concepts through his or her own efforts. This avoids the mental blocks which so often occur in children faced with purely abstract concepts. Specially designed equipment helps children to grasp concrete ideas along with the sensory experience of numbers, quantities and mathematical operations. Gradually children can move confidently to complete abstract mathematical problems. The environment should be aesthetically pleasing and simple to the eye. Help the child develop the language skills which are listening, speaking, reading and writing. First through the sand paper letters, the child learns both the sounds and shapes of the letters. Then he listens for the sounds in words and begins to build them using the Montessori movable alphabet. The phonic approach is used in the Montessori method. The child is taught to read after careful preparation and when he shows he is ready, he succeeds and finds reading an enjoyable activity.Furthermore, while the child is absorbing his own language in the Montessori method, he is exposed to games and activities which introduce him to the correct use of grammar. This approach helps lay sound foundation for the future. The Montessori approach covers a wide range of subjects which reflect the broad interests of young children. The Montessori environment stimulates these interests and extends knowledge and understanding of art and crafts, geography, history, music, science and the natural world. Cultures from around the world are explored and celebrated. Children are admitted in th Play group on first come first serve basis as seats are limited; However, admission in Montessori classes is open throughout the year to fill in any vacancy. A child can be admitted from the age 21/2 to 5 years. Admissions will be granted, subject to clearing interviews. For Montessori classes an informal assessment is taken combined with an interview with the parents. At registration an appointment is given for the parents to meet with the In-charge of the section. The child is assessed in an informal environment separately. Both parents must be present at the time of the interview failing which the application may be cancelled. * Application for admissions is taken on prescribed school form. * Registration does not in any way confirm or guarantee admission. It means recording the name of the child for the purposes of admission subject to getting through an informal assessment and interview and subject to a vacancy being available. * The class for which a child is to be assessed is determined according to his/her age at the time of interview and not according to the age put down at registration. * The decision of the school cannot be challenged in any way and will be absolutely final. * The registration for Montessori starts from the first week of August every year. 2- Admission formalities should be completed no later than the date given in the letter, failure to do so will result in cancellation of the admission and the vacancy will be offered to the next candidate on the waiting list. 3- Original birth certificate must be produced at the time of completion of formalities. Photocopy of the Birth Certificate will be required for retention in school records. Four passport size photographs should be submitted along with the admission form. 4- All information sought on the school form should be factual and correct as it cannot be changed or modified later. After completing the admission form pack, you will be issued, a fee bill to be deposited in the designated Bank. The admission officer will facilitate you in the completion of the admission formalities.